90 Day Fiance Larissa Christina is blasting Colt Johnson once again. This time over money – accusing him of leaving her nearly penniless. The Brazilian babe is throwing new accusations at her estranged husband. Ever since their altercation and her third arrest last month, Colt and Larissa have been mudslinging on social media. The latest allegations between Larissa and Colt are all about the Benjamins and she’s pointing the finger at her almost-ex-husband. Larissa Christina already made several shocking claims against Colt Johnson in the past. And these don’t seem to be stopping anytime soon. In her latest Instagram tirade, the 90 Day Fiance star spilled new allegations against her estranged husband. The feisty brunette is not holding back in spilling the tea. She’s sharing her version of what she has went on behind the scenes in their failed marriage. 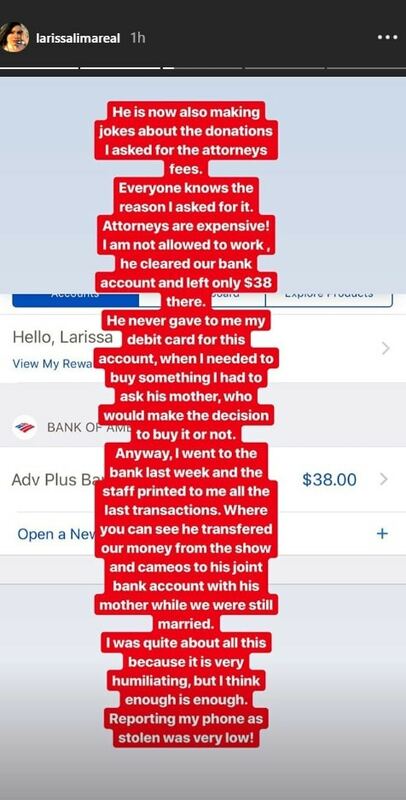 Apparently, Larissa is accusing Colt of wiping out their bank account. You can see the latest installment in their he-said, she-said battle below which includes a copy of balance information from Bank of America. According to Larissa Christina, Colt Johnson cleared out their bank account without her knowledge. The 90 Day Fiance claims all their earnings from the TLC show and Cameo videos were taken, leaving the account almost empty. The reality TV personality alleges her former husband transferred all the money to his joint account with mother Debbie Johnson. Apparently, bank records revealed that Colt made transactions from January 3 to 11, just days before he asked for a divorce. If you look at the screen shots below, you can quickly add up that almost $5,000 was moved from the account. However, there’s no proof that the money came from joint income opportunities. TLC and Sharp Entertainment reportedly only pay the American spouse, not the foreigner, so like it or not, those payments would have been in Colt Johnson’s name. With her bank account almost empty, Larissa Christina claims she’s struggling financially. The 90 Day Fiance alum points out that legal fees and daily expenses are quite challenging to produce, especially since she’s still not allowed to work in the country. 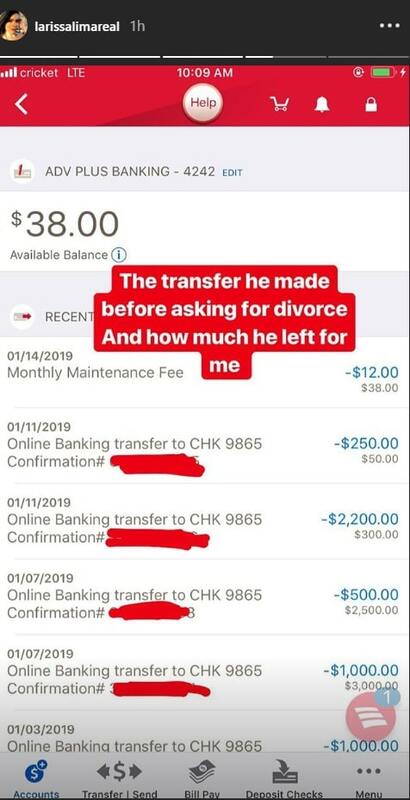 As Larissa claims her ex-husband left her with only $38, that’s not enough to pay for a lawyer, clearly. She also revealed in the post that Colt never gave her a debit card for their account. She said anything she wanted to buy had to run through Debbie who would decide if she got it or not. The paltry amount begs the question of how Larissa affords some of the stuff she shows herself doing on her Instagram like drinking champagne in hot tubs and posing for pics from spendy-looking hotel rooms high above the Vegas strip. Perhaps she has a job now? In addition to money matters, Larissa Christina also accuses Colt Johnson of sabotaging her phone line. The 90 Day Fiance alleges that her ex-husband was the reason behind her phone’s deactivation. 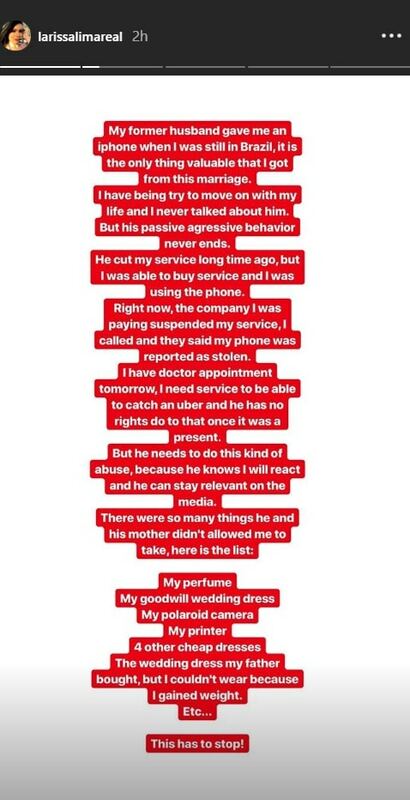 According to ex-90 Day Fiance Larissa, her phone service was cut off after Colt reported her iPhone as stolen. However, she insists that the device was actually a gift from Colt back when she was still in Brazil. Larissa adds that she managed to pay for new phone service after Colt first deactivated it last year. The reality star reiterates that her former hubby has “no rights” to do that, especially since the phone was a present. Aside from the phone, Larissa Christina also alleged there are several items she had to leave behind. 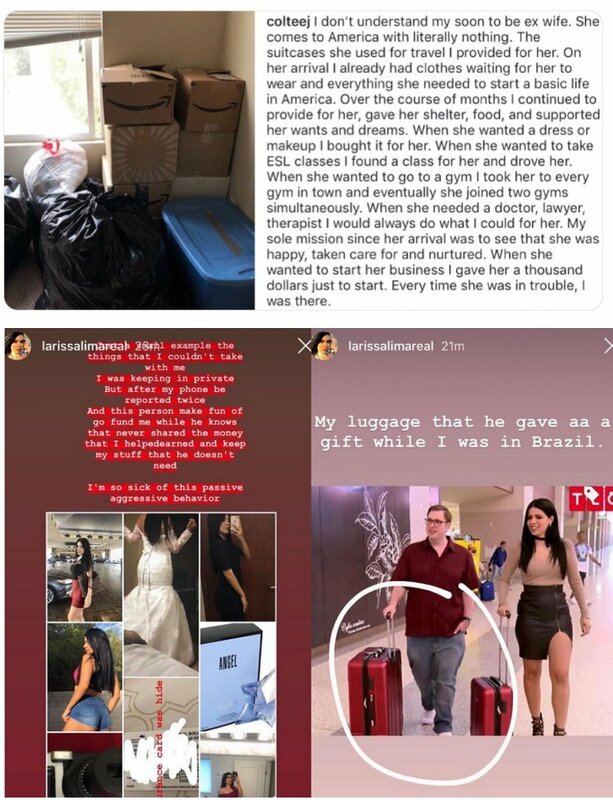 The 90 Day Fiance star alleged that Colt and Debbie prohibited her from taking her belongings. These include her Goodwill wedding dress, Polaroid camera, luggage, printer, four cheap dresses, and a wedding dress she says her father bought. 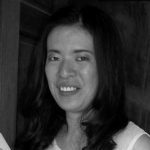 “He needs to do this kind of abuse, because he knows I will react and he can stay relevant on the media,” Larissa vented. So far, Colt Johnson has yet to react on Larissa Christina’s latest accusations. However, if you look above at the social posts, they are two sides of the same seemingly bitter coin. They seem to agree on what he bought her, but not much else.